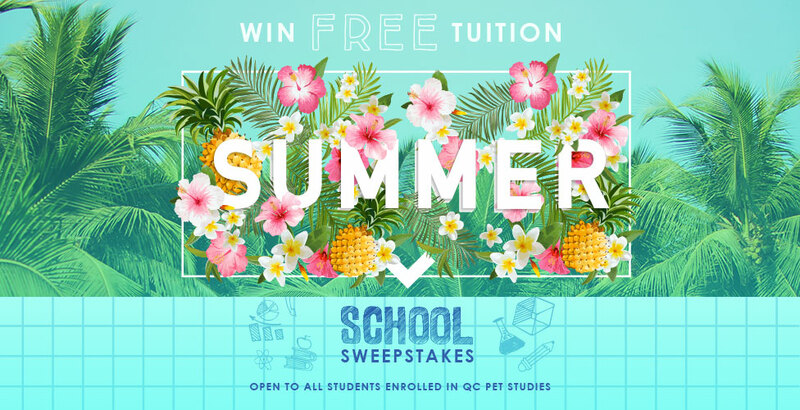 From now until June 30th, ALL students of QC Pet Studies can enter the Summer School Free Tuition Sweepstakes for a chance to win their full tuition! That’s right, win this sweepstakes and your QC tuition is on us! Step 5: The lucky winner will have his/her tuition FULLY REIMBURSED! This includes shipping fees, your deposit, and your course fee(s)! When you enter the sweepstakes, you have three entry. You can earn additional entries to the sweepstakes when you comment on the Sniffin’ Around Blog, complete assignments in your course, visit our Facebook page, follow us on Twitter, and tweet about the contest (you can do this once a day!). The free tuition draw will take place on Friday, June 30th, 2017. The winner will be announced no later than July 3rd, 2017. And we hope you do! We’ll contact you by phone or by email with the good news no later than the Monday after the draw. We’ll then proceed to refund all your course fees, including shipping and deposit fees. If you happen to be on a monthly payment plan, we’ll void future payments and you’ll be marked as having “paid in full”!